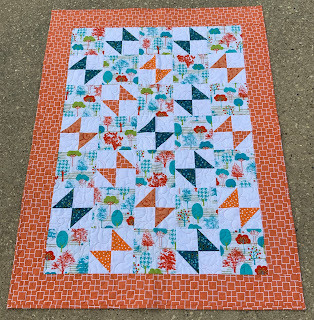 It's that time of the year ... Sarah at Confessions of a Fabric Addict is hosting her annual Hands2Help Comfort Quilt Challenge. This is her 9th year and the contributions continue to grow with the help of so many giving quilters. I feel very blessed to be part of Sarah’s mission and hope for many more years to come. 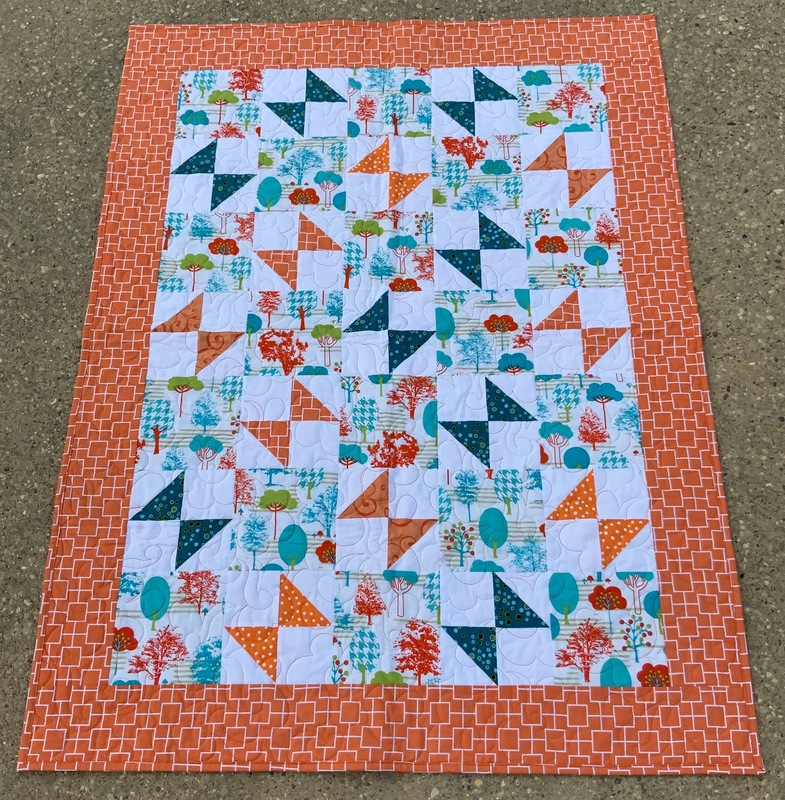 This year, I am Sarah's first guest blogger, introducing my newest pattern for making comfort quilts, "I Love You More”. For the story behind the name and free tutorial/pattern, please visit today’s post at Confessions of a Fabric Addict. If you have been directed here from Sarah, please feel free to browse a little. Become a blog follower, add L'Fair Quilts through Bloglovin' (link on my home page) or follow on Instagram @lfairquilts. 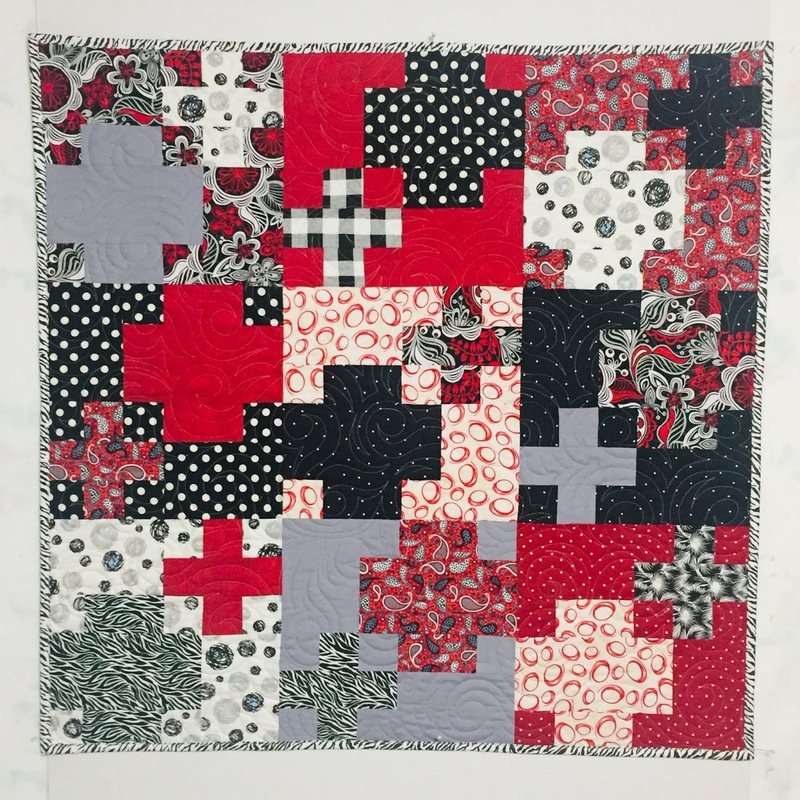 I am also one of the designers for Black Cat Creations, a great company with new and fresh designs for any type quilter. 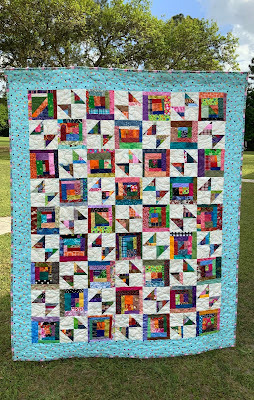 Join them on FaceBook and/or Instagram, (@iloveblackcatcreations), which also includes their designs as seen through the creative eyes of other quilt makers. Now .... enjoy six (6) versions of “I Love You More” below, and then return to Confessions of a FabricAddict for complete instructions to make your own. The first two are dedicated to the 2019 H2H Comfort Quilt challenge. Finished Size: 62" X 86"
Thank you for letting me share this special pattern, “I Love You More”. 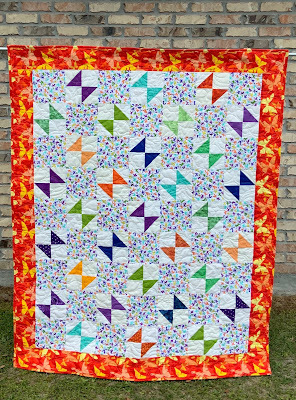 If you make your own version, please email us (see profile) a picture or tag #Iloveyoumorequilt, #lfairquilts, #hands2help2019 on Facebook and/or Instagram. I am so tempted to continue with future colors for these strings blocks, they are an easy block to make. I have the perfect pattern forming in my head. And....I just noticed, my finished project from yesterday .... has both yellow from last month and green. The Tea Towel Shams are screaming SPRING! 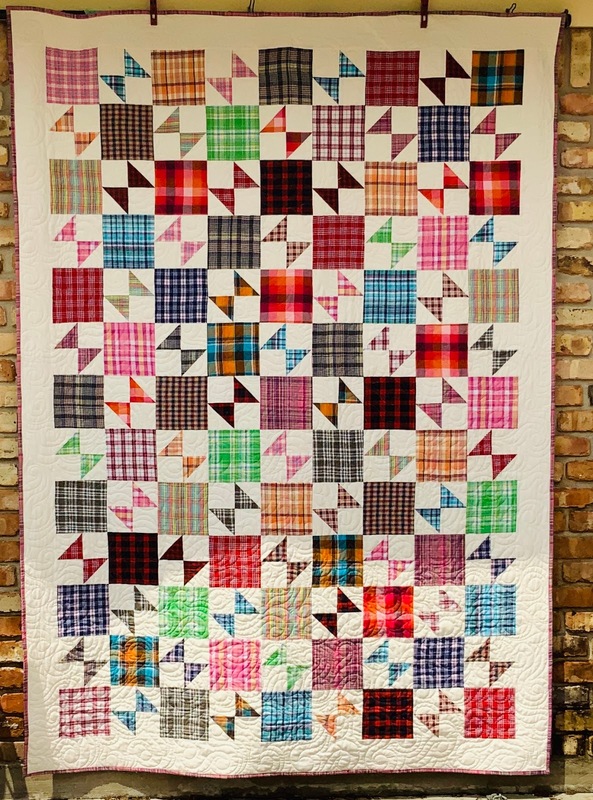 Linking up with So Scrappy, 2019 Rainbow Challenge. 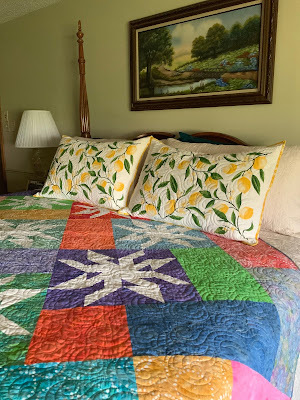 It was time to pull out my SPRING bed quilts - this week I chose my Batik Mystic Ponds (A Black Cat Creations Pattern). 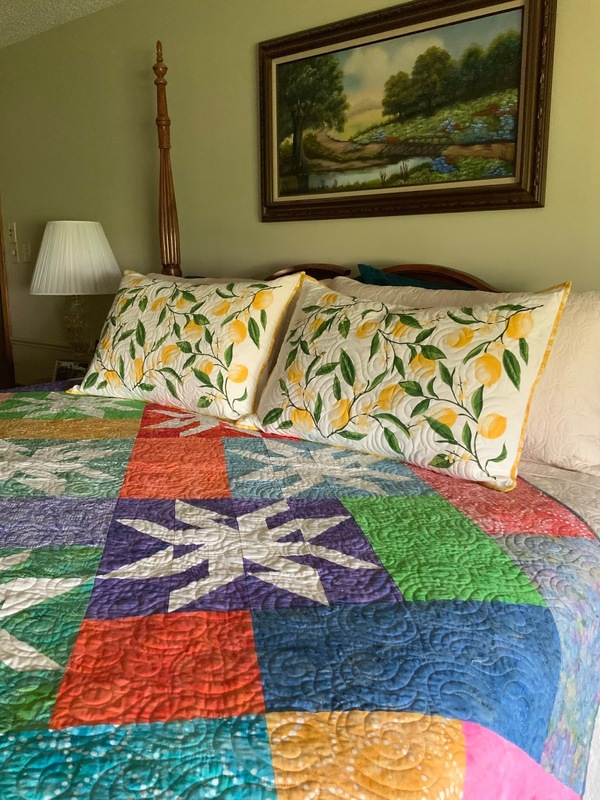 But the big finish this week is the pair of quilted pillow shams, made from tea towels I found at Hobby Lobby. 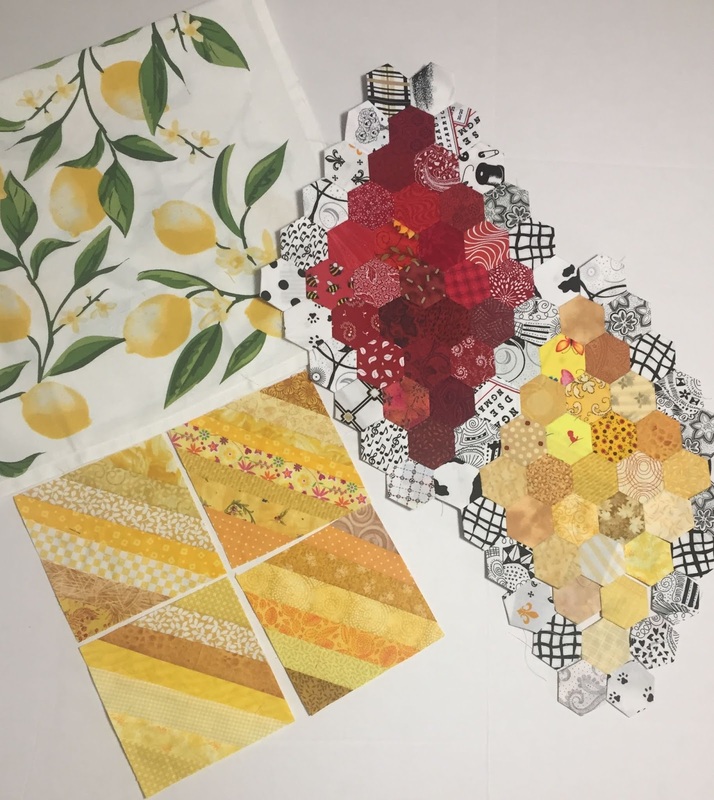 Quilters quilt, so why not take these sweet little tea towels and quilt them. I removed the hems, sandwiched with left-over batting (Hobbs of course) and quilted a small romantic swirl. I used Kona Cotton (Snow) for the backing and a bright yellow binding. The back has open overlapping panels for easy pillow inserts. 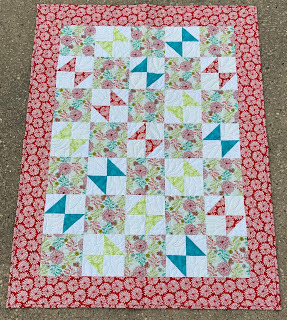 The Kona backing is not quilted. 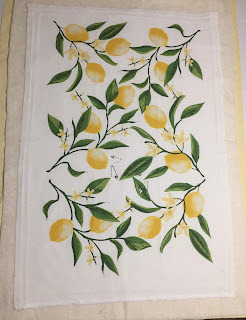 I have always had a little obsession with Tea Towels, so these shams are giving me such great satisfaction. I sure won't be drying any dishes with these towels .... and ..... I see many more projects with my collection in future. 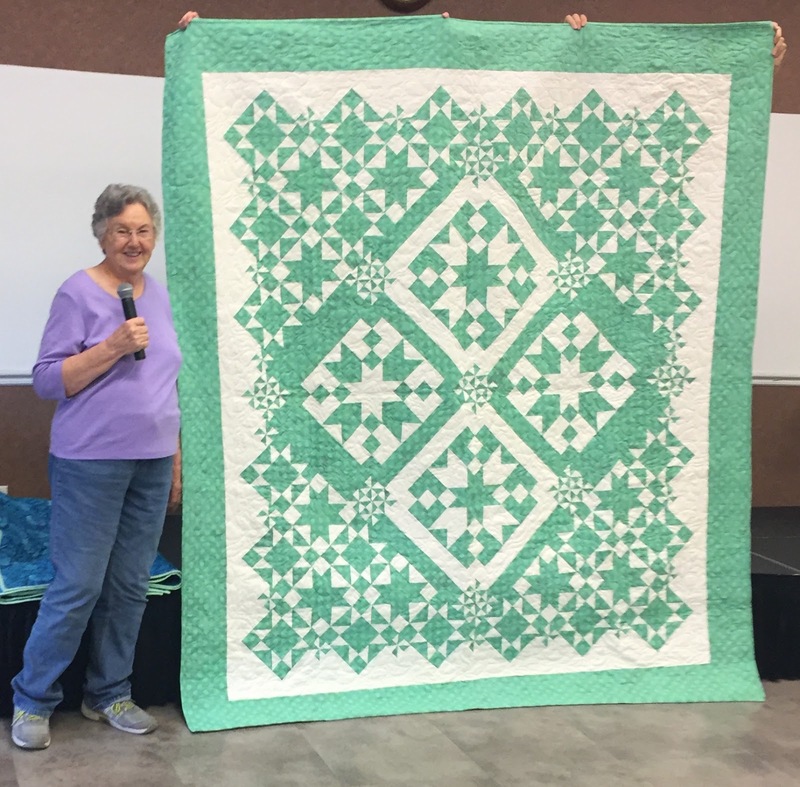 A member of our local Cane Cutter Quilt Guild, Carol Martinolich, presented her two-color version of my Acappella pattern. Carol's use of just two fabrics has a stunning impact. Thank you so much Carol for sharing! And...perfect timing for the celebration of St. Patrick's Day. Kelly Girl Update: With the addition of the green hexagons, I am so happy I started this quilt. 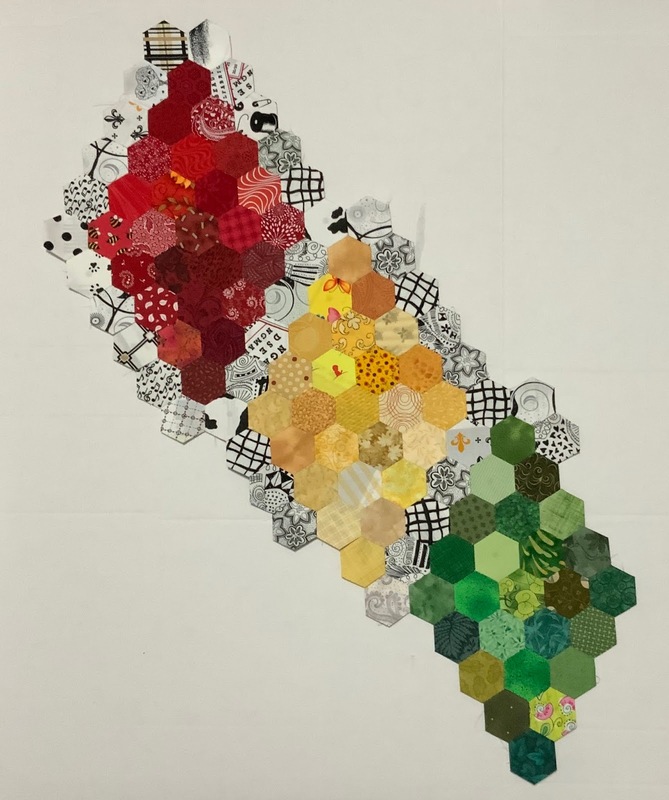 Mine will be a smaller version of Kathy's Quilt, but with hopes of the same impact. 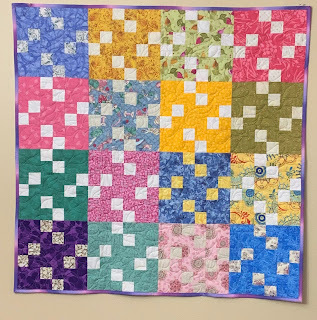 Glittered Nine patch Blocks, made in the 2018 Rainbow Challenge have been used to finish a small quilt, donated to the Upside Downs. 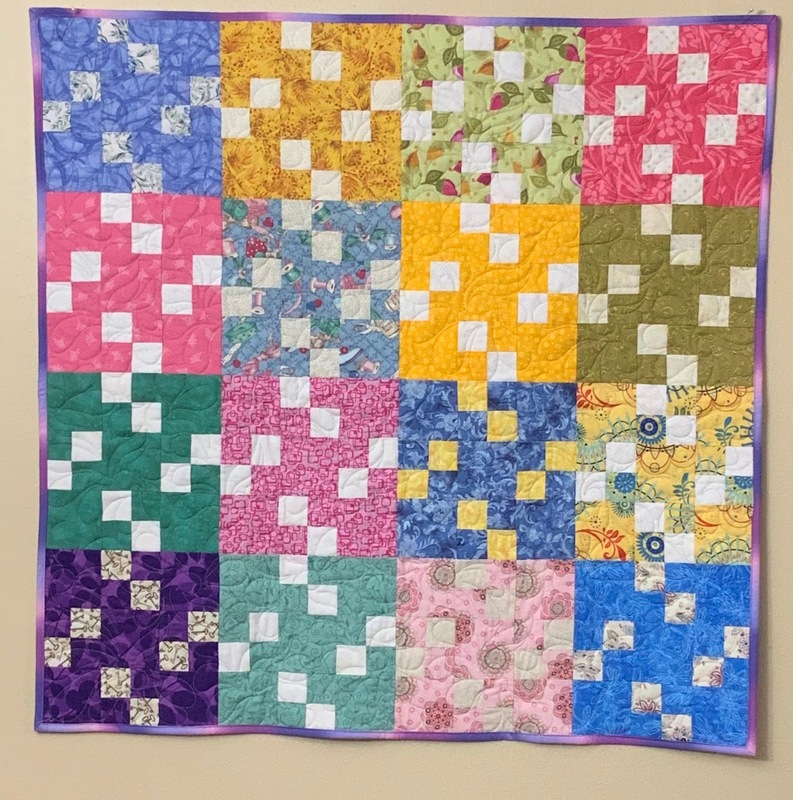 This organization promotes the "Upside" and positive aspects of Down syndrome and uses the quilts in gift baskets for new parents. 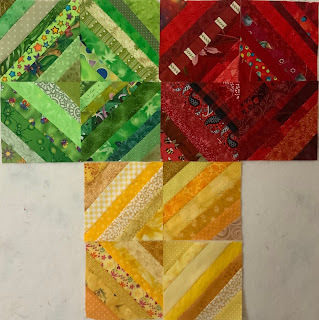 Linking with the 2019 Rainbow Challenge. In addition to having a problem with collecting fabric...there is a tiny little issue with Tea Towels. 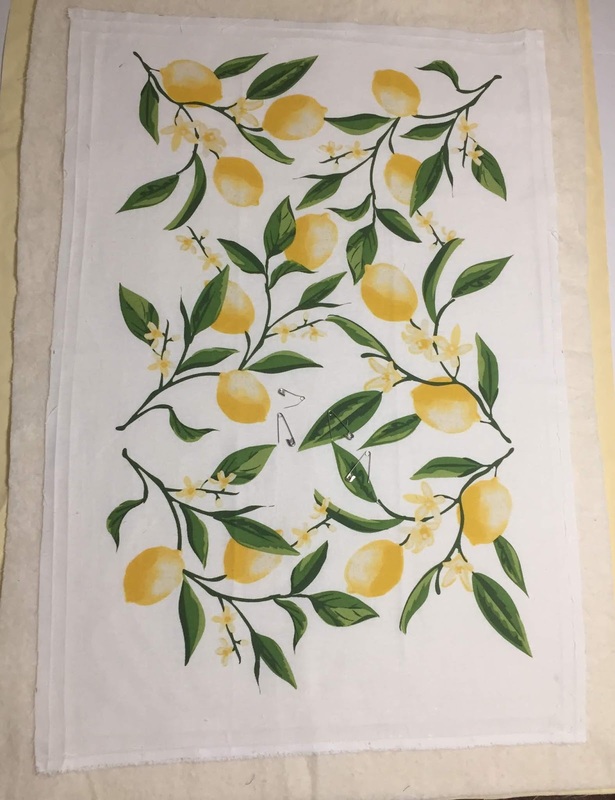 Don't the lemons just scream Spring??? I still have a few from my grandmother's stash that she made from feed sacks. Kelly Girl Quilt: The yellow hexagons are attached except for the three at the bottom and a few black/white. This has been a great on-the-go project and is so relaxing. String Blocks: Four 5 1/2" yellow/gold strings. No problem finding enough strings to whip these up. 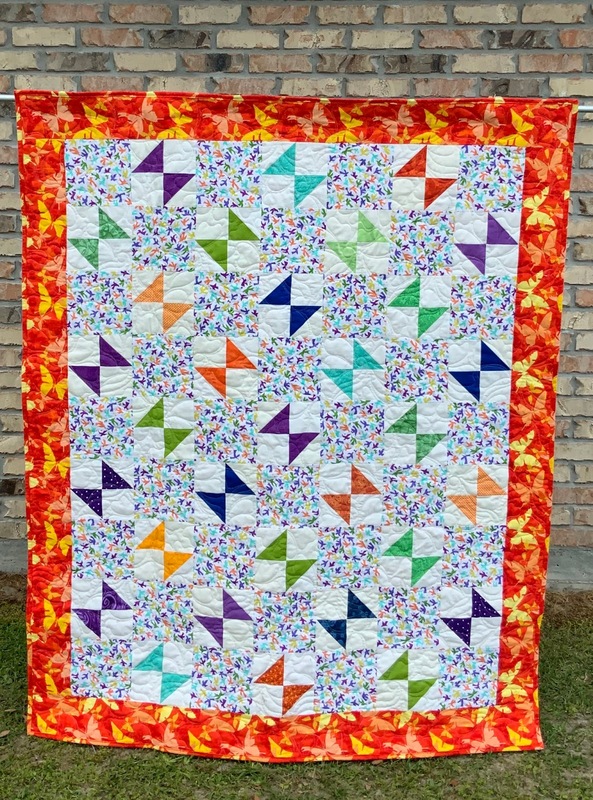 Linking up with Angela at the 2019 Rainbow Scrap Challenge/Scrap Happy Saturday. 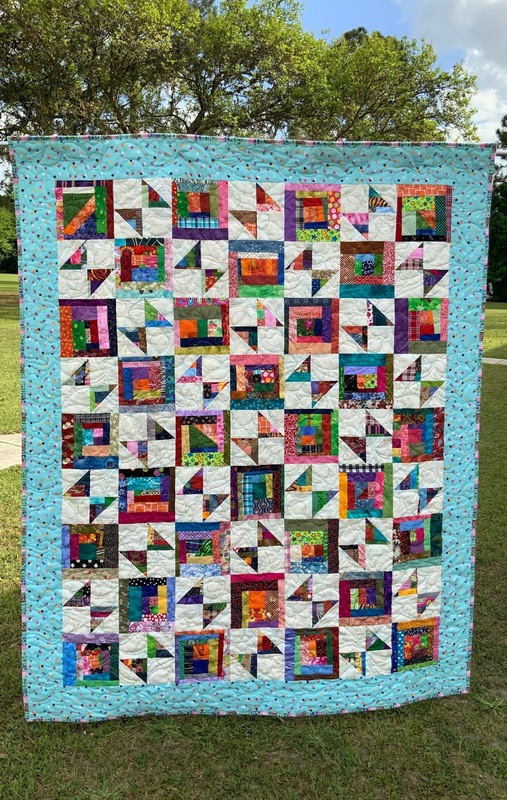 This year, I have made a personal goal to increase the number of charity children's quilts. 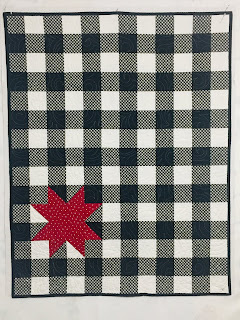 In addition to "Quilts For Kids"; I will be making quilts for the Petite Bijoux Project and Upside Downs. The mission of the Petite Bijoux Project is to provide parent care packages for preemies at the Terrebonne General Medical Center NICU patients. 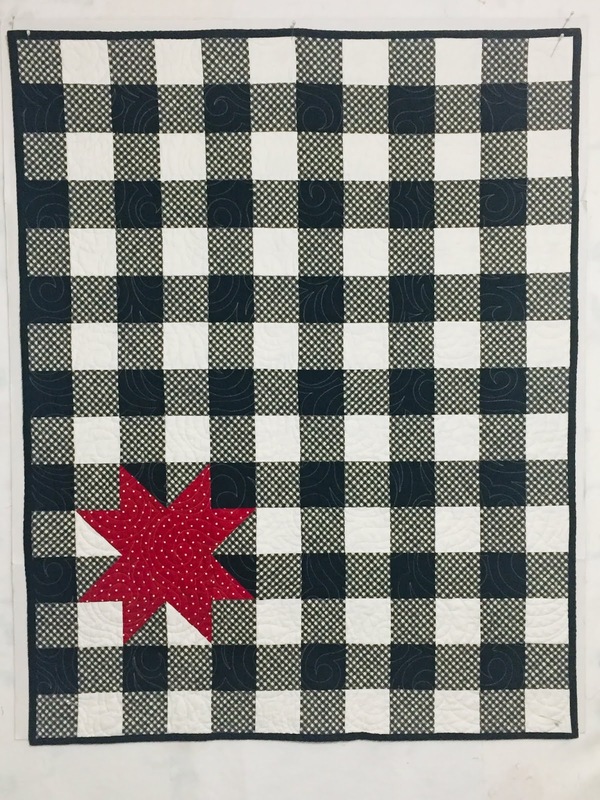 "A Star is Born", finishes at 36" X 45" and uses black and white Kona with a dark gray (3 1/2" blocks) to make a popular Buffalo Print. The addition of the star symbolizes the tiny, but mighty, preemie. The mission of the Upside Downs, Inc. is to help the Down Syndrome community through new parent support, recreational activities, raising awareness and advocating for a brighter future. 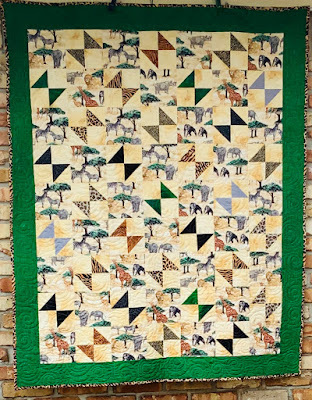 The quilts received by Upside Down are part of care baskets gifted to new parents. 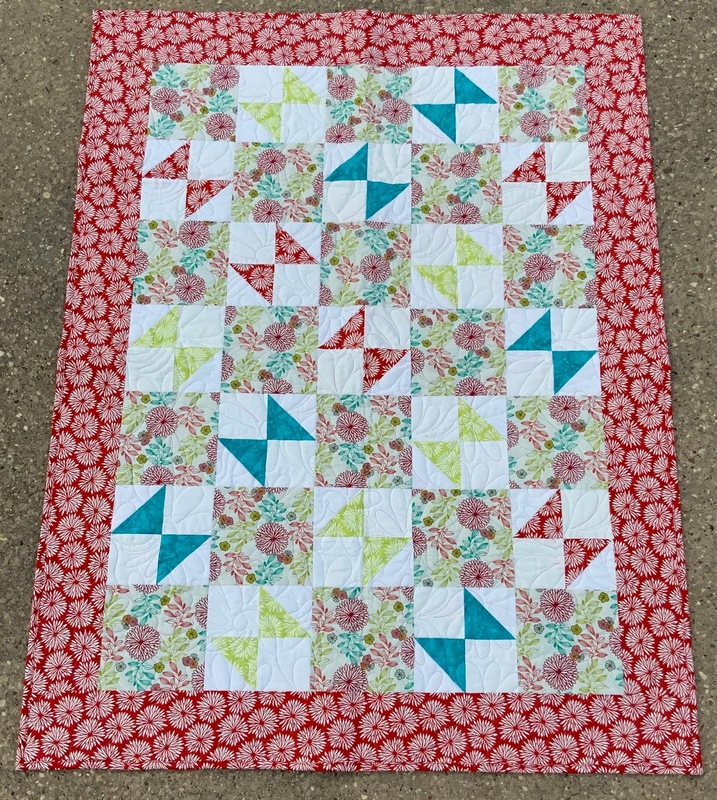 My free block pattern, "Have Faith", was introduced in 2018 during Sarah's / Confessions of a Fabric Addict, Hands 2 Help Challenge. 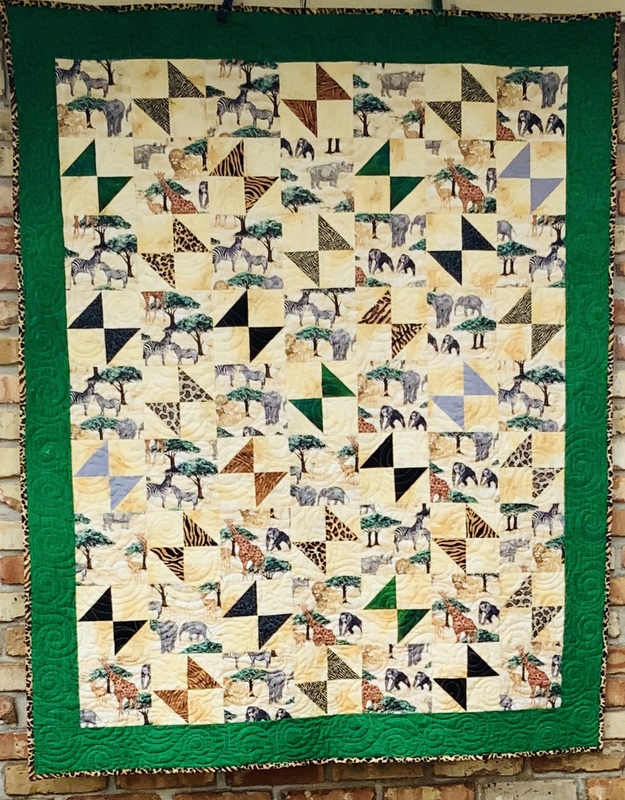 Using nine (9) blocks, the Have Faith quilt below, finishes at 36" X 36". 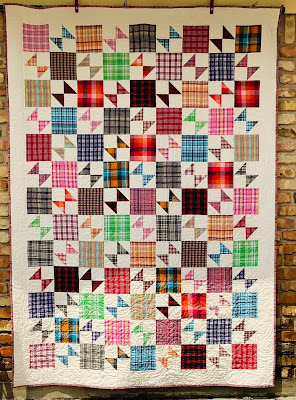 Linking up with Sarah at Confessions of a Fabric Addict for Friday Finishes -- WHOOP!